On the small island of Whalsay in the Shetland Isles two young archaeologists are undertaking a dig on the croft of the elderly Mima Wilson, hoping to find the remains of an old merchant house. In a practice trench they discover a human skull and other bones. The following night Mima is shot dead in a seemingly tragic accident. Inspector Jimmy Perez journeys to the island to investigate, aided by Sandy Wilson, the grandson of the deceased. Perez is not convinced it’s an accident, but there’s little evidence to suggest foul play. As the two cops probe, the long-standing tense relations between two island families surface, with rumours circulating as to the provenance of the old bones. When a second death occurs, this time a supposed suicide, Perez knows he’ll need to use the past to flush out the killer before they strike again. 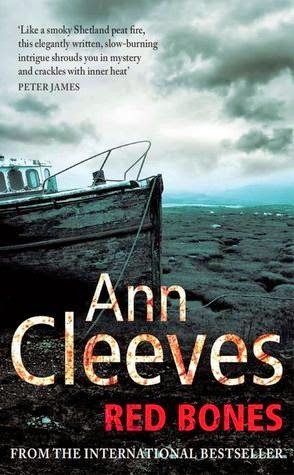 Red Bones is the third book in Ann Cleeves Shetland series featuring Inspector Jimmy Perez (here are my reviews of books 1 and 2). 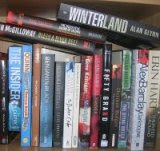 The strength of the tale is the sense of place, atmosphere, characterisation and social relations. Cleeves drops the reader into the wild landscape and seascape of the Shetland Isles, vividly portraying the desolate and isolated beauty and the close relationship between people and place. Moreover, she nicely captures the close knit nature of small communities, inter-linked through familial connections and generations of friendships and rivalries, and uneasy relations with blow-ins and visitors. The style is quite descriptive, providing plenty of detail about each character, their back story, the settings, and historical context. This works to produce an interesting narrative, but also leads to a slow pace, perhaps fitting of the setting and tale, and to some repetition in observations. The plot is relatively straightforward and I felt the police procedural elements were a bit thin, especially with respect how each death is dealt with, for example in terms of postmortems which should have been standard and would have transformed the investigation. Rather it is driven more by gut instinct and a certain amount of bumbling around. Overall, an enjoyable, atmospheric tale. Cleeves talked about this book on one of the panels she was on at Left Coast Crime last Spring in Monterey. I was intrigued then and continue to be. I have the book but it's buried in a stack somewhere. Must dig it out.